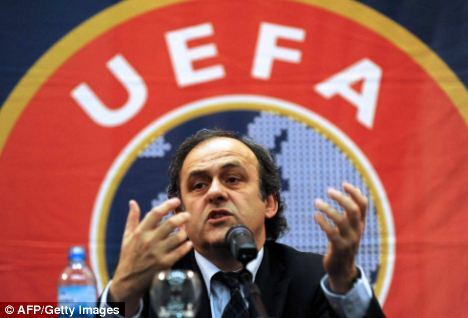 Over the past couple of days, I have been shocked, appalled and outraged by a couple of things, including a misguided statement by Michel Platini, president of Union of European Football Associations (UEFA) - organizer of Euro 2012 co-hosted by Poland and Ukraine. Following the release of a disturbing video report about anti-semitism and racism in stadiums in Poland and Ukraine, Mario Balotelli, a revered and at the same time controversial football striker said he would walk off the pitch if racially abused at Euro 2012. Although I did not welcome Balotelli's threat to "kill" anyone who racially abused him, I was impressed by, and welcomed his threat to walk off the pitch in protest if racially abused by racist football fans in Poland and Ukraine. But unfortunately not everyone supports players who would walk off the pitch in protest. Rarely do officials threaten to punish victims of crimes and abuse, but Michel Platini did just that when he said football players who walk off the pitch at Euro 2012 due to racial abuse will be booked. Apparently, Michel Platini is more interested in protecting the reputation of the game than protecting and standing in solidarity with players like Mario Balotelli who are more often than not subjected to racism in the so-called "beautiful game." Listening to Platini's interview on BBC Sport, I was stroke by his "protect the game" rhetoric. The interview reveals that he is more concerned about protecting the game (his source of income) than protecting victims of racism and abuse. Players walking off the pitch in protest are - from Platini's viewpoint - bad for business. Giving referees power to stop matches in cases where players are racially abused is not enough. Fighting racism should not be left at the discretion of referees alone. Referees have had power to take action against racism by stopping game for a number of years. [Source], but this has not solved the problem. Players have the right to protest and they should be allowed, without fear of retribution, to walk off the field of play after being racially abused - especially when referees, stewards and police prove to be incapable or unwilling to handle the situation. Such protests would force officials like Michel Platini with vested financial interests in the game to take racism in football more seriously and take more stringent action against the social ill that damages the game and negatively impacts lives. It is objectionable to force players to play in an environment where they feel uncomfortable, threatened and violated. Victims of racial abuse should not to issued yellow or red cards. The assertion by Michel Platini that any players who walk off the pitch at Euro 2012 due to racial abuse will be booked is misguided. This is not the first time that a football official has downplayed the impact of racism. In 2011, Sepp Blatter, president of FIFA said football does not have a problem with racism on the field and that on-pitch racism can be solved with handshake. UEFA has tried to combat racism, but the organization has clearly not done enough. It should not resort to forcing victims to stay on the pitch. Players should have the liberty to walk off the pitch when they feel uncomfortable and racially abused. They should not be further victimized by officials who have a duty to protect them from racist predators.